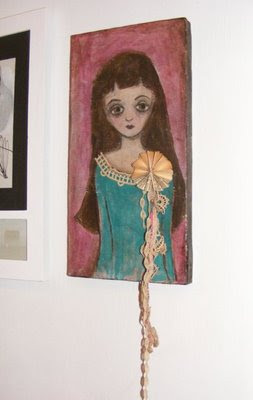 Here is "Little Primitive Girl," from the video below, all decked out and finished with a paper pinwheel and some lace. I'm excited about my new little pink Flip video camera and hope to post some how-to's and tutorials on YouTube soon, although the whole video editing thing is pretty new to me. Let me know what you might like to see on video in the future! Lovely! You are very talented. Love the print!! I watched your video, I thought I would have aheart attack when I saw the water drip down her face!!!! LOL. This is just too cool!!! I would like to see you work on a body image using Designer's Gouache paint, in real time or speeeded up; but prefer it in real time.